Nib Type: Superflex BB Stub Imprints: No Length: 5 3/8"
COMMENTS: Parker Jack Knife Safety 24 in smooth black hard rubber and nickel trim. The 24 model is significantly thicker (wider diameter) than the more common 20 model. 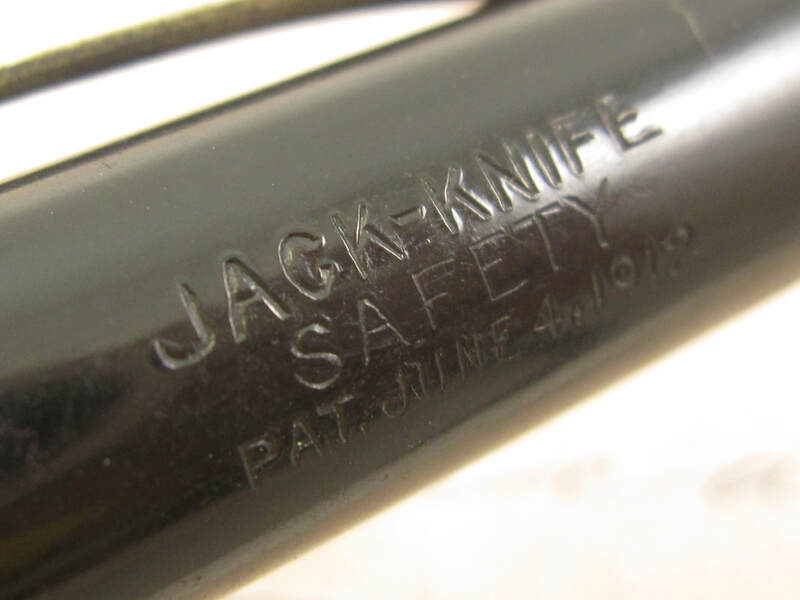 The Jack Knife Safety was the predecessor to the Duofold model. Fitted with a monotone 14K Parker Lucky Curve medium flex BB stub flex nib. 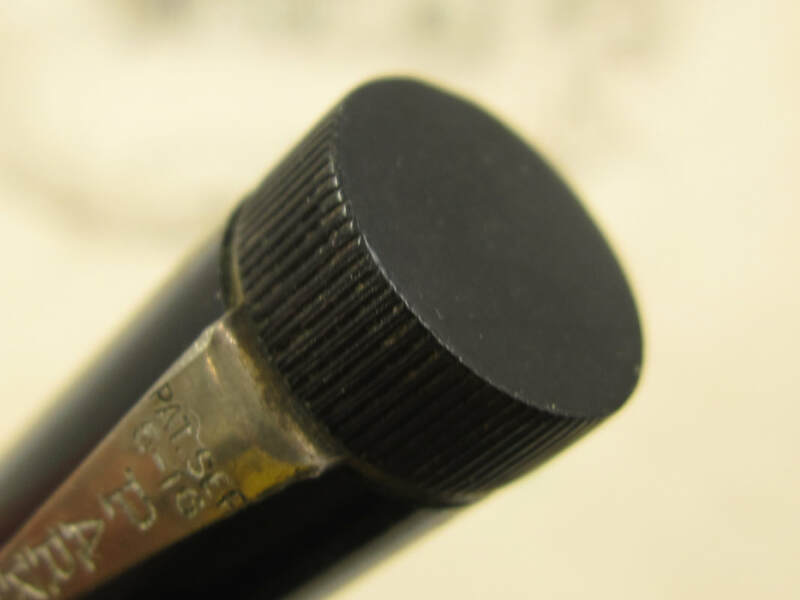 When not flexed, this nib writes a double broad line in the down strokes and a fine line in the side strokes. 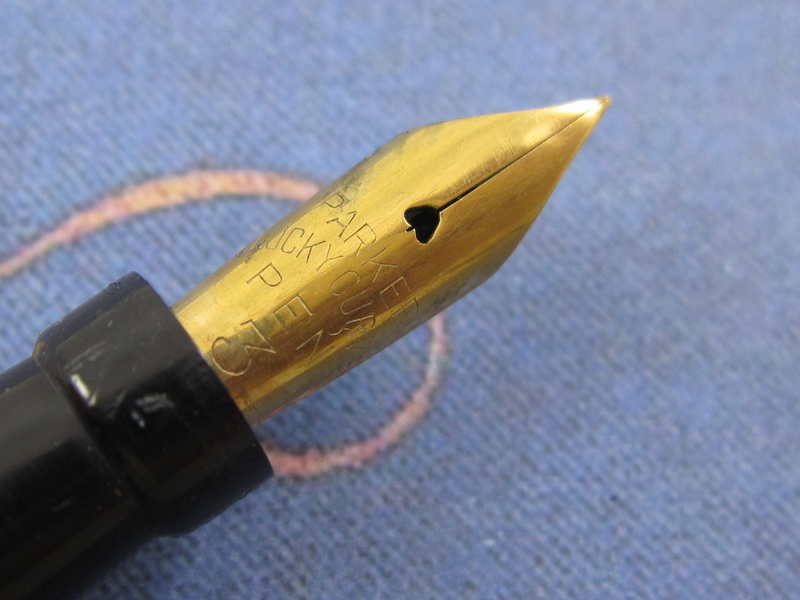 When flexed, this nib writes a BBB line in the down strokes and a fine line in the side strokes. 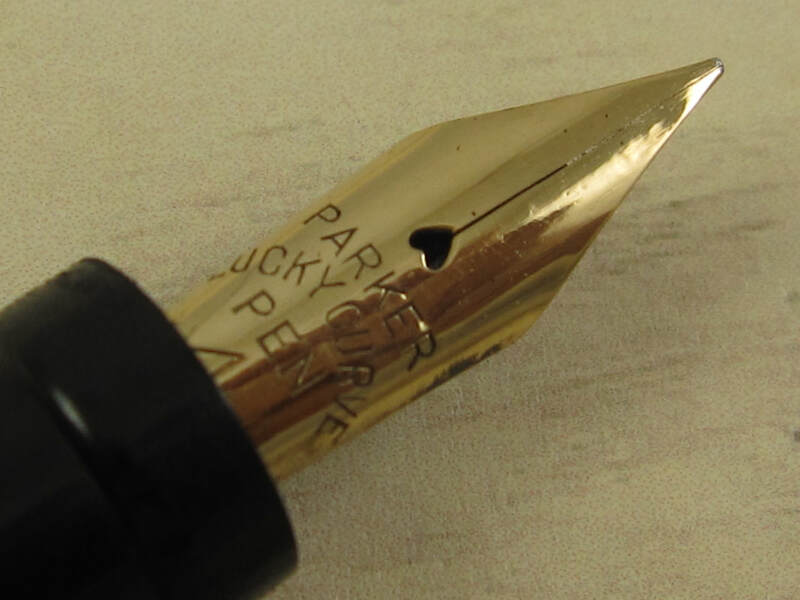 Very smooth nib, capable of writing at any speed when not flexed. 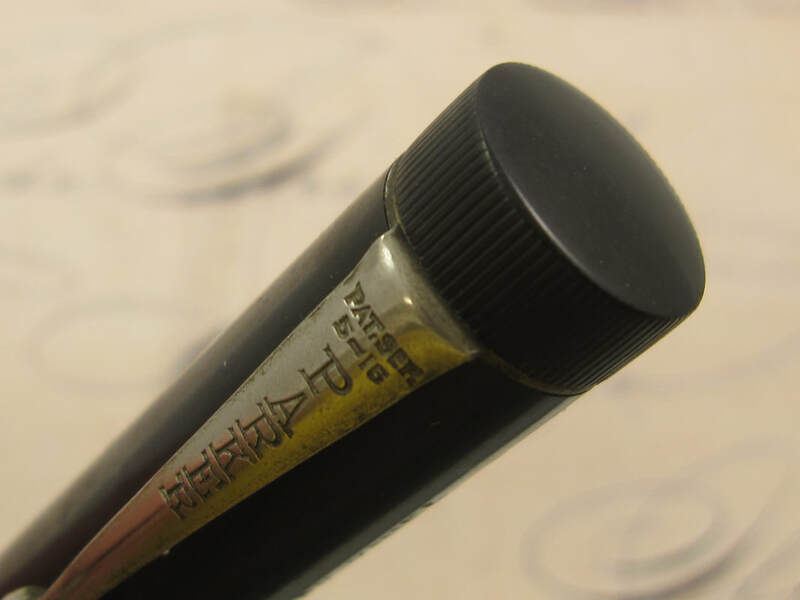 This nib has the "scroll type" imprint, making it a more valuable nib. 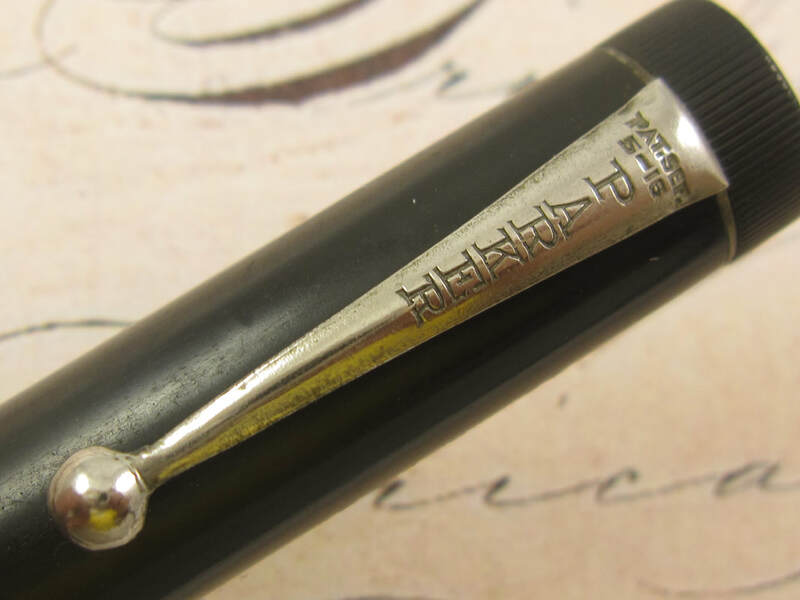 It is also an ultra rare nib as most Jack Knife pens came with "pointed" and not "edged" nibs. Black hard rubber is in great condition and with nice and even colors. 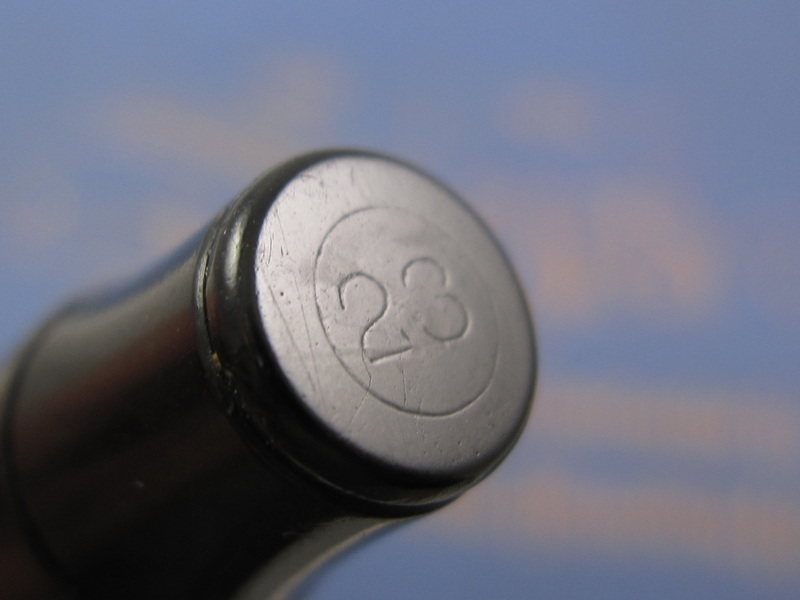 Perfect barrel, cap, and blind cap imprints. Correct "Christmas Tree" feed. A tad of tarnish on the clip. Button filler. Made in the USA in the second half of the 1910s. 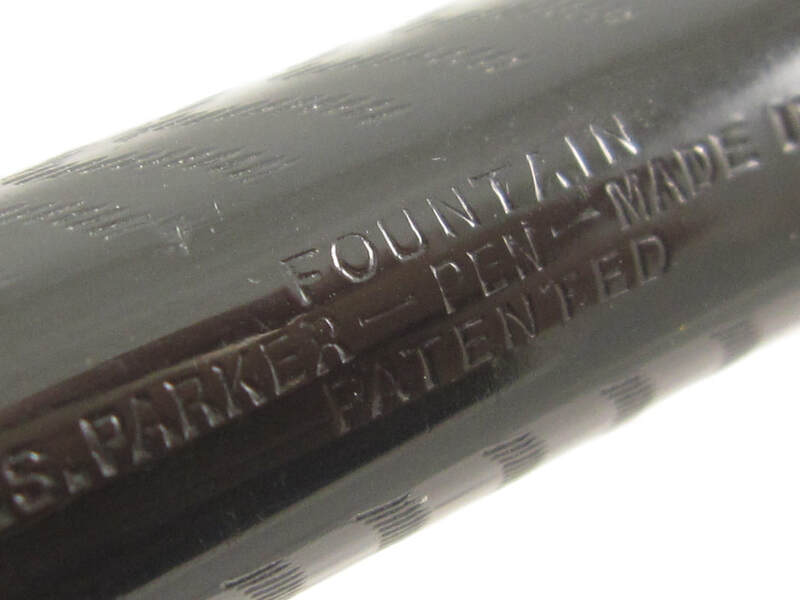 Nib Type: Superflex BB Stub Imprints: No Length: 4 5/16"
COMMENTS: Parker Jack Knife Safety 24 pen in smooth black hard rubber and nickel trim. Short version, measuring 4 5/16" (capped) and 5 3/4" (posted). 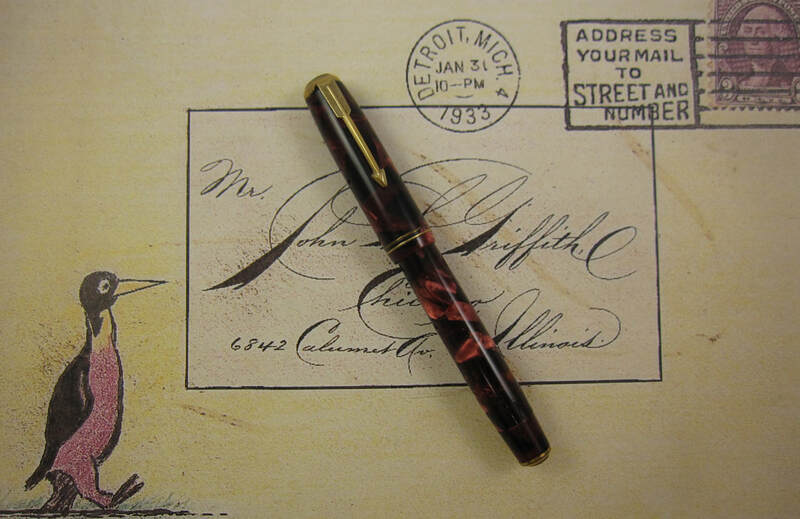 This pen has very wide diameter with a larger sized vintage flex nib. 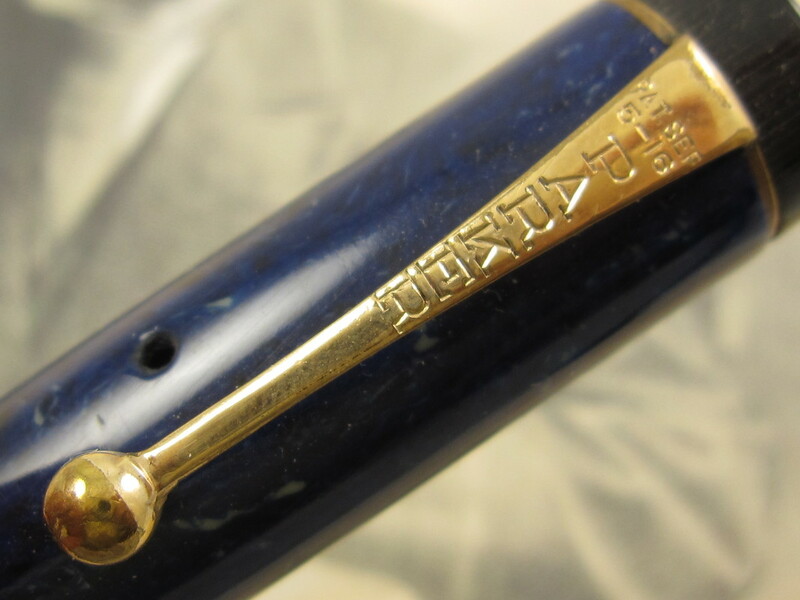 Fitted with a 14K Parker Lucky Curve #4 with the "banner" style imprint on the nib, a more valuable nib. 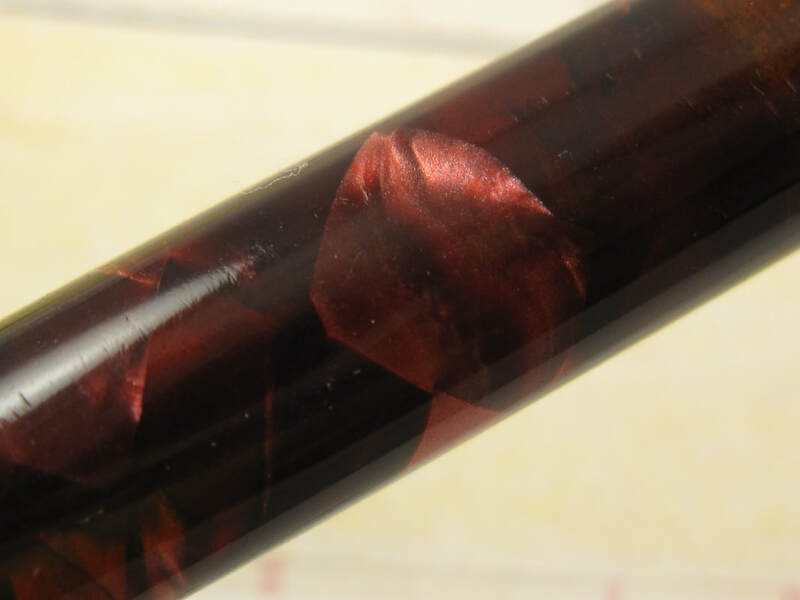 This is a superflex BB stub nib. 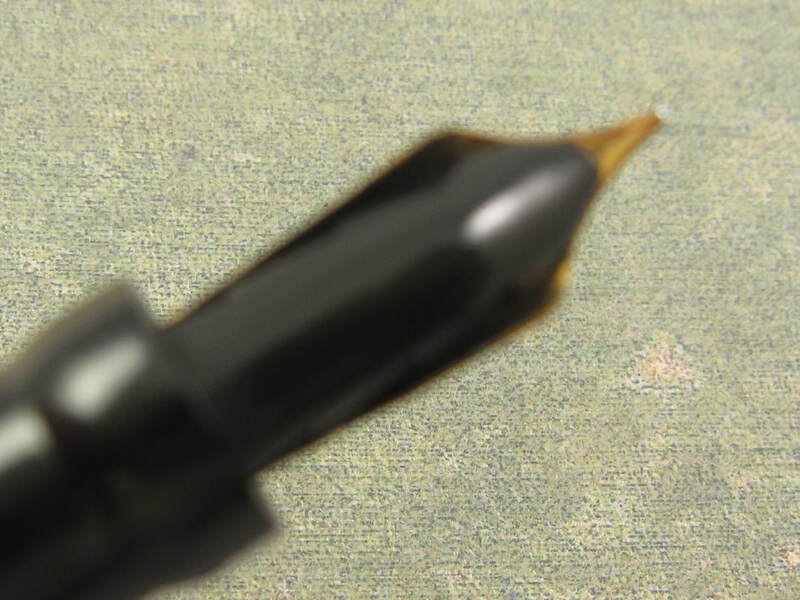 Ultra smooth nib capable of writing at any speed when not flexed. 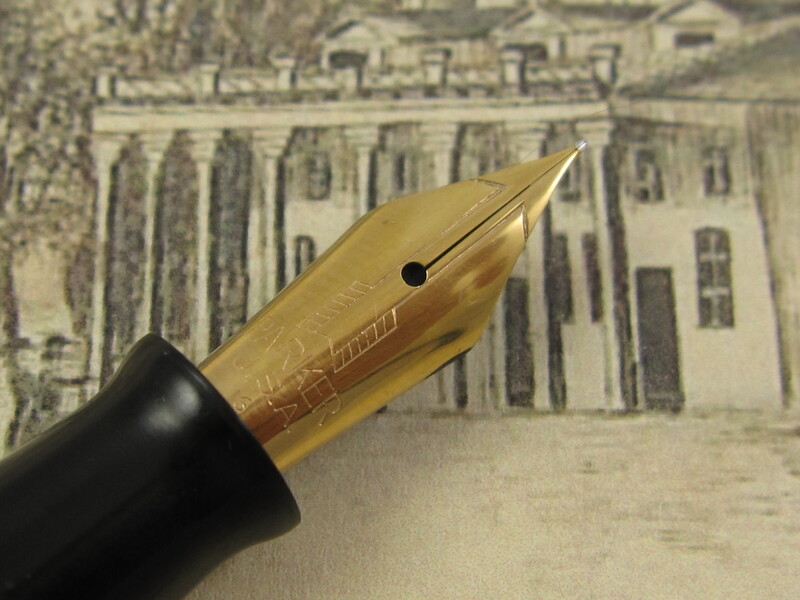 When not flexed, this nib writes just like a firm BB stub nib. Once flexed, it is capable of producing very thick vertical lines in the down strokes, as shows in the picture with the writing sample above. 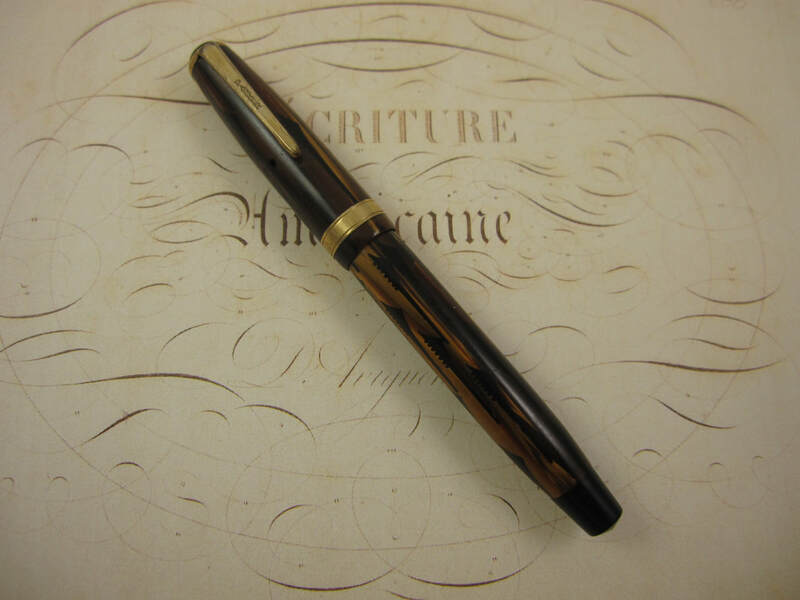 Very clean pen with great color, barrel imprint and lustrous black rubber color. Very minor tarnishing in the nickel trim. Button filler. New sac. Made in USA in the 1910s. Nib Type: Superflex XF-BB Imprints: No Length: 5 1/4"
COMMENTS: Parker Jack Knife Safety 23 in black chased hard rubber and nickel trim. Clipped cap. 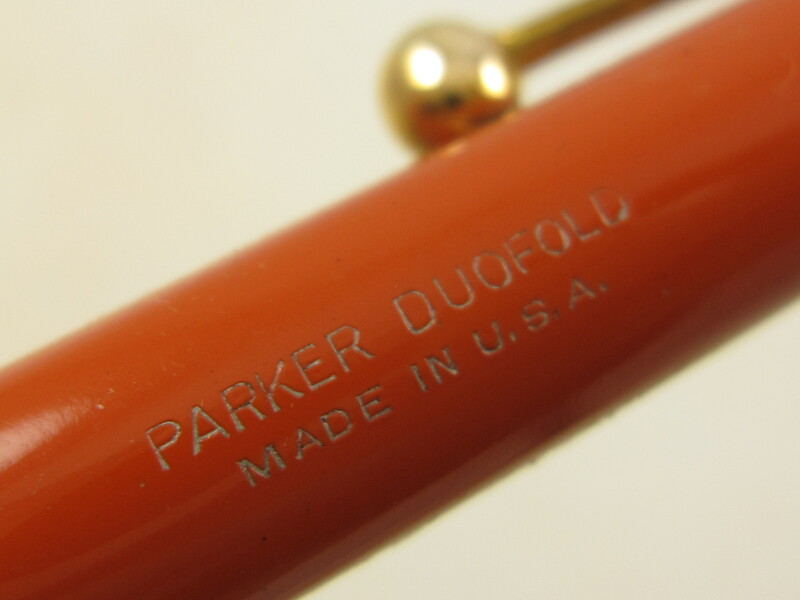 The Parker Jack Knife Safety model is the predecessor of the Parker Duofold model. Jack Knife pens were made in different models/sizes and this particular samples is the full sized version with a larger #3 nib. 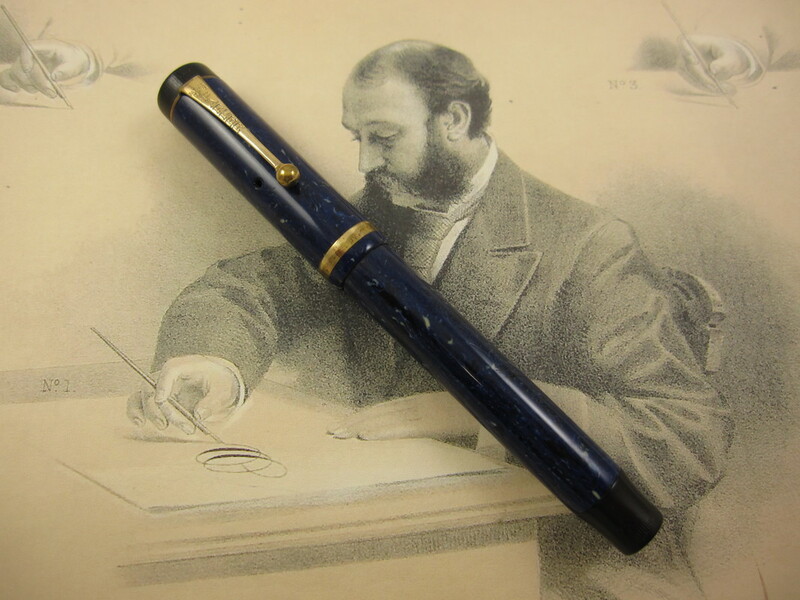 Due to its model, larger size and more collectability, this pen is more valuable than the more common model 20. 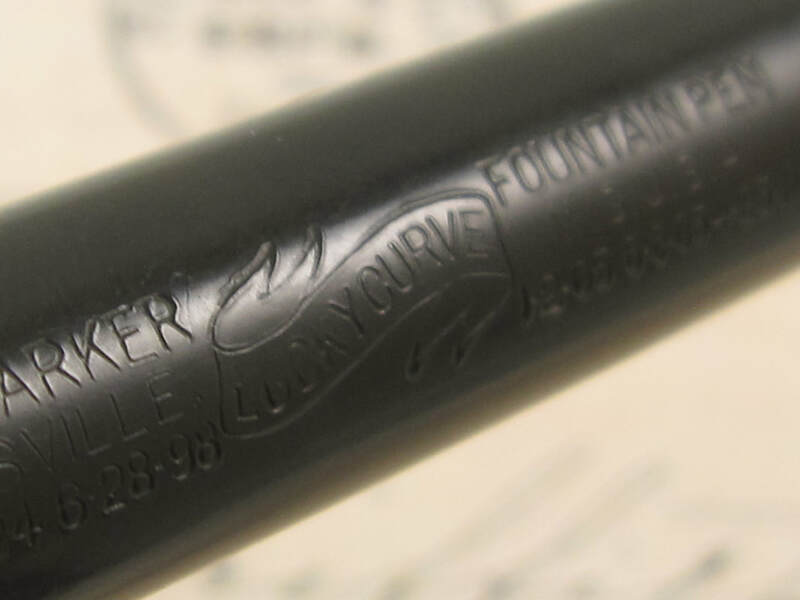 Fitted with its correct 14k Parker Lucky Curve #3 superflex nib that writes an extra fine to double broad line. 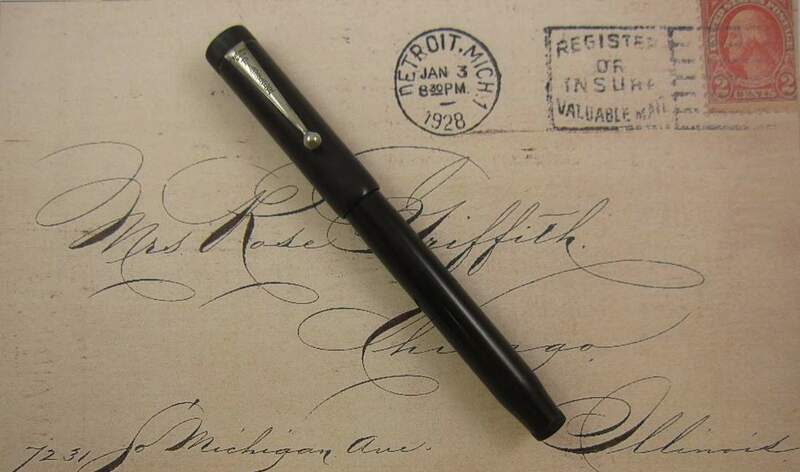 Smooth nib, capable of very thin lines and also capable of writing at any speed when not flexed. Correct Christmas tree feed. This exterior has some discoloration and the clip has some corrosion. 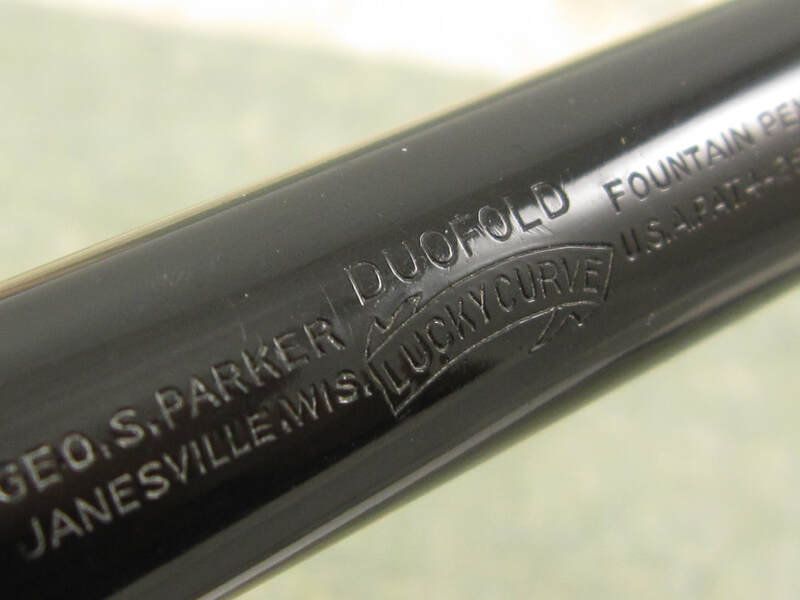 Great imprints on the barrel. Button filler mechanism. New sac. Made in USA in the later part of the 1910s. 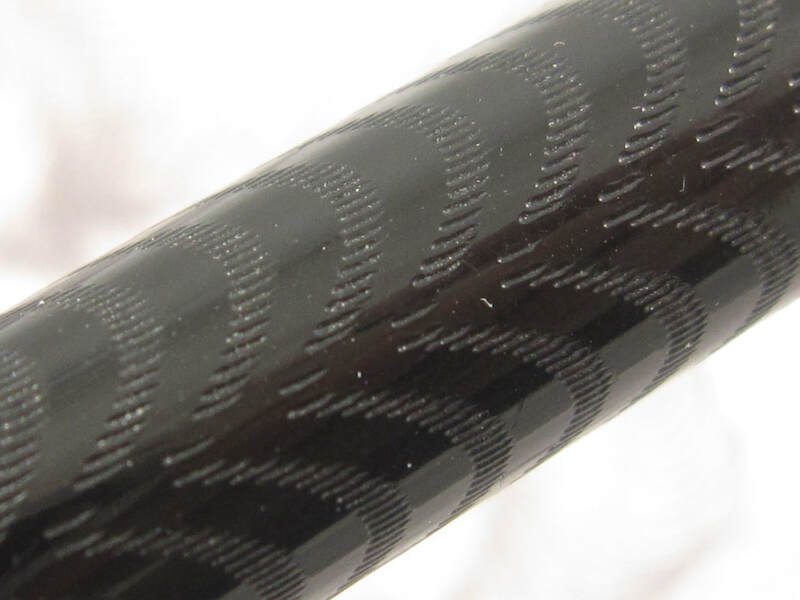 COMMENTS: Parker Lucky Curve in smooth black hard rubber and nickel trim. 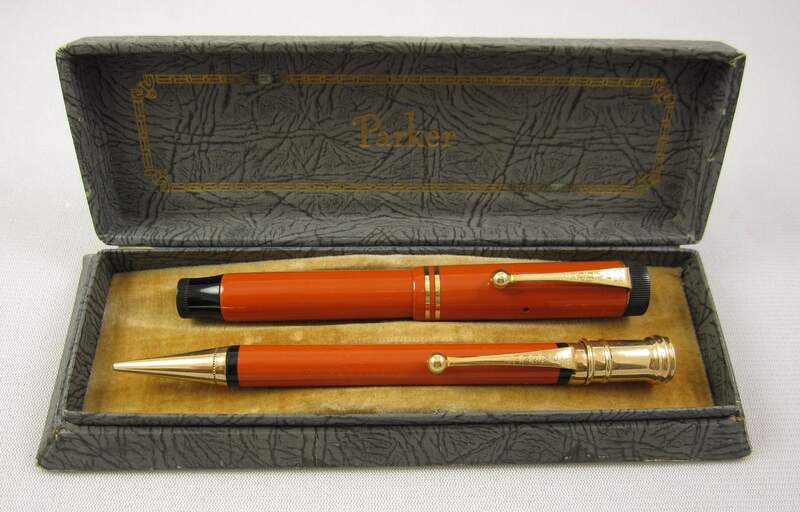 Full sized pen, equivalent in size to its predecessor Parker Jack Knife Safety 24, measuring 5 1/4" (capped) and 6 1/2" (posted). 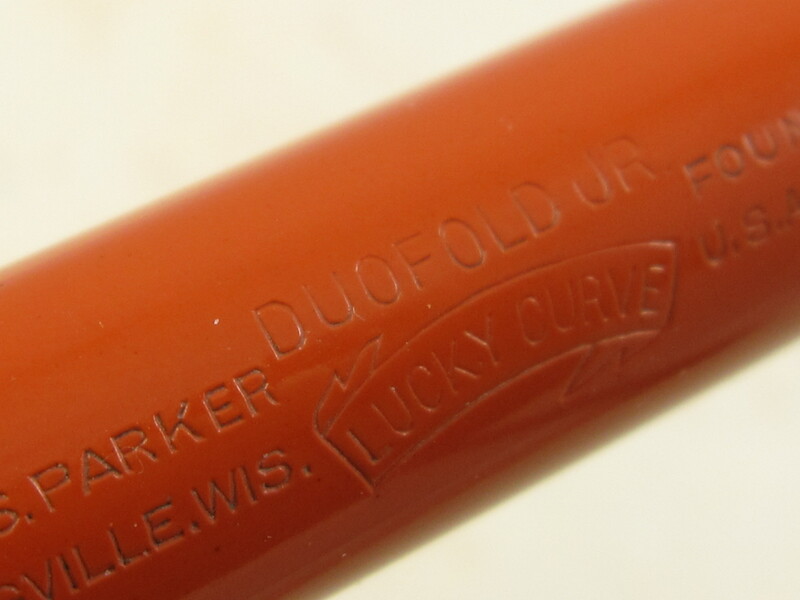 Fitted with a 14k Parker Lucky Curve #4 superflex nib that writes an extra fine to double broad line. Nib is capable of thin lines and also capable of writing at any speed when not flexed. 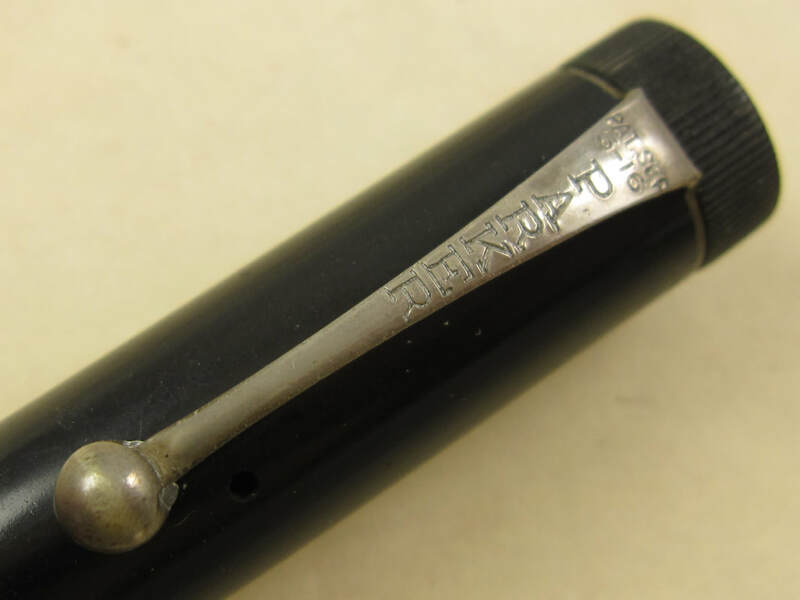 "Scroll" type imprint on the nib, making it more valuable. Correct "Christmas Tree" feed. Good exterior color. Great barrel imprints. Light tarnish on the nickel trim. Barrel is very slightly warped, but nothing significant or visible to the naked eye. Button filler. New sac. Made in USA in the 1920s. 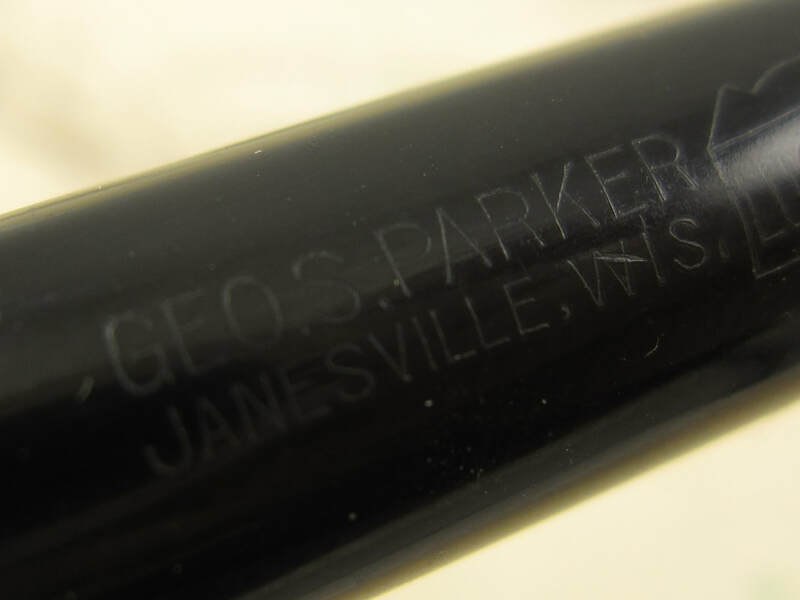 Nib Type: Fine, Springy Imprints: No Length: 5"
COMMENTS: Parker Lucky Curve in black chased hard rubber and gold trim. Streamlined profile. 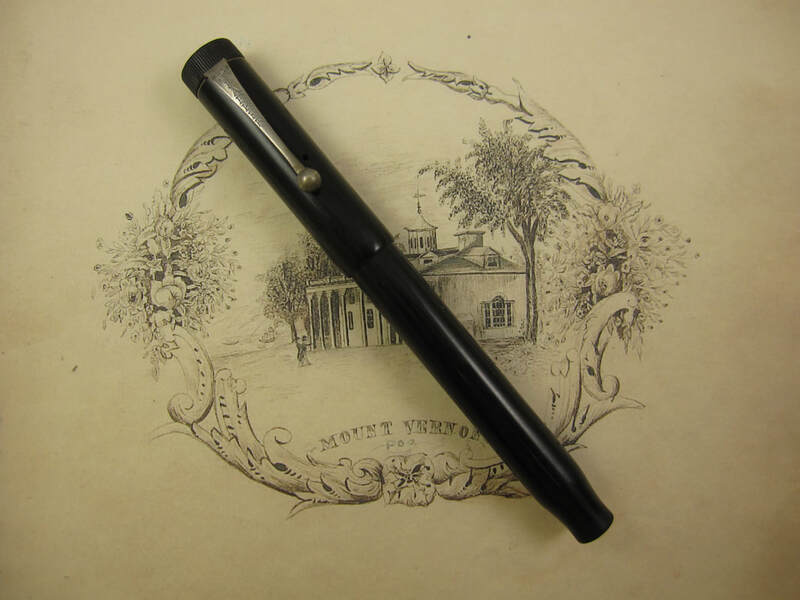 Flat-top and full sized pen. Fitted with a 14K Parker nib that writes a fine line. 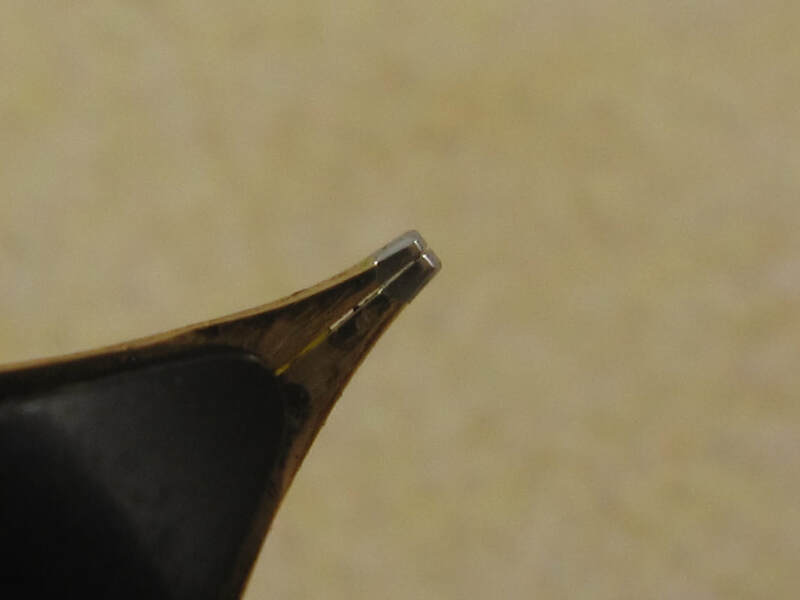 I would grade this nib as a springy nib. It is not a flexible nib as it will not produce line variation, but it will provide a little "cushion" feel when using it. Professionally adjusted nib. So smooth it glides on paper. Great black rubber color with perfect chasing and lots of black luster and gloss. Perfect barrel imprints. Perfectly clean gold trim. 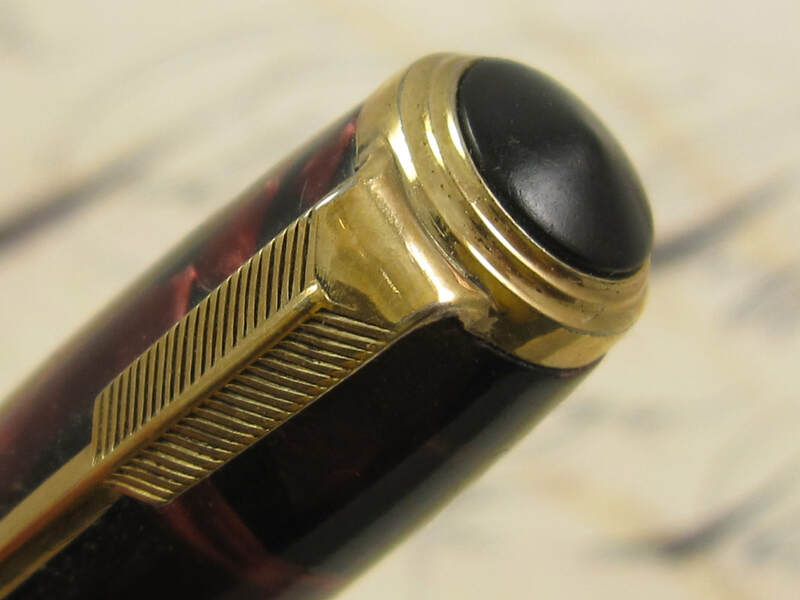 If it were not for a tiny dent in the nib right under the "K" letter, this pen would be marked as in mint condition. 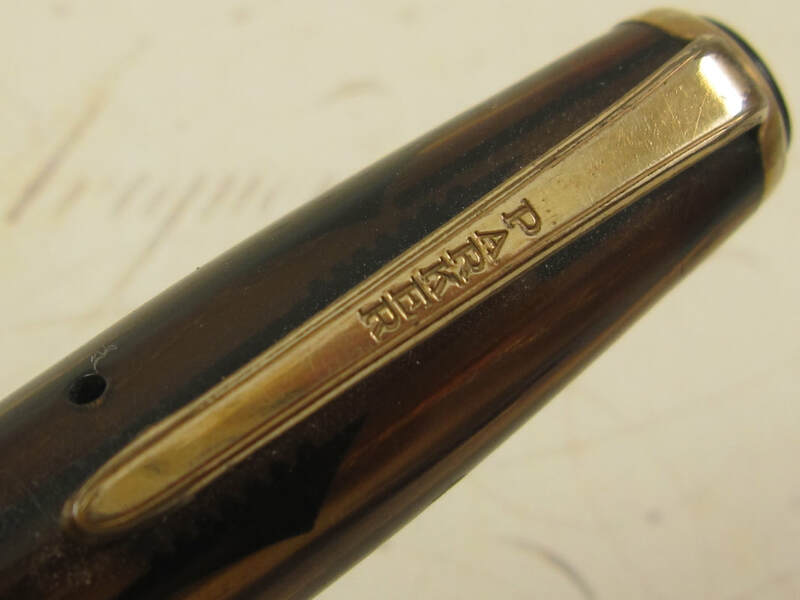 It is very hard to find vintage pens that are about 100 years old in this condition. Button filler mechanism. New sac. Made in Canada in the 1920s. 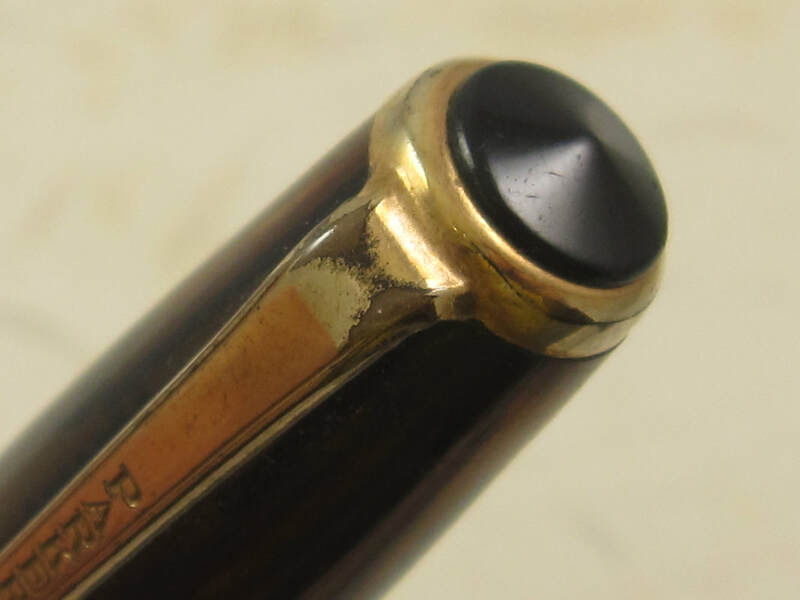 Nib Type: Broad, Stubbish Imprints: No Length: 5 1/2"
VERY RARE ITALIAN PARKER !!! 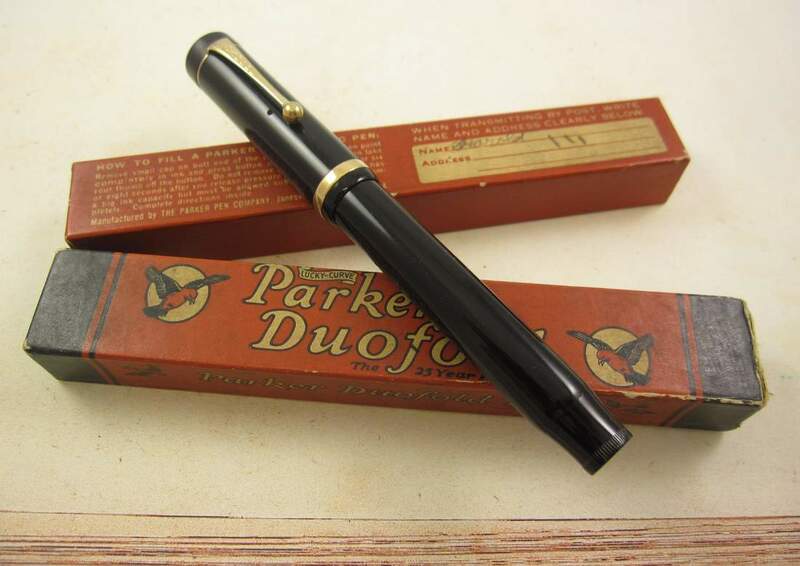 Nib Type: Fine, Firm Imprints: No Length: 5"
COMMENTS: A very rare vintage Parker pen ... Parker Duofold Senior in Black with gold trim, made in Italy. Cap has two gold slim bands. 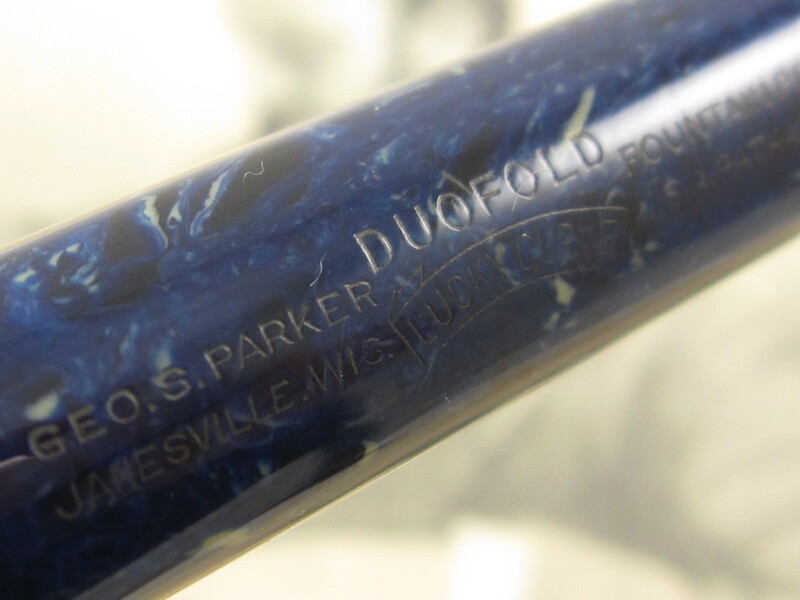 In terms of proportions and profile, this pen looks almost identical to the Parker Duofold pens made in England. Oversized diameter, a little streamlined exterior and 5" in length. 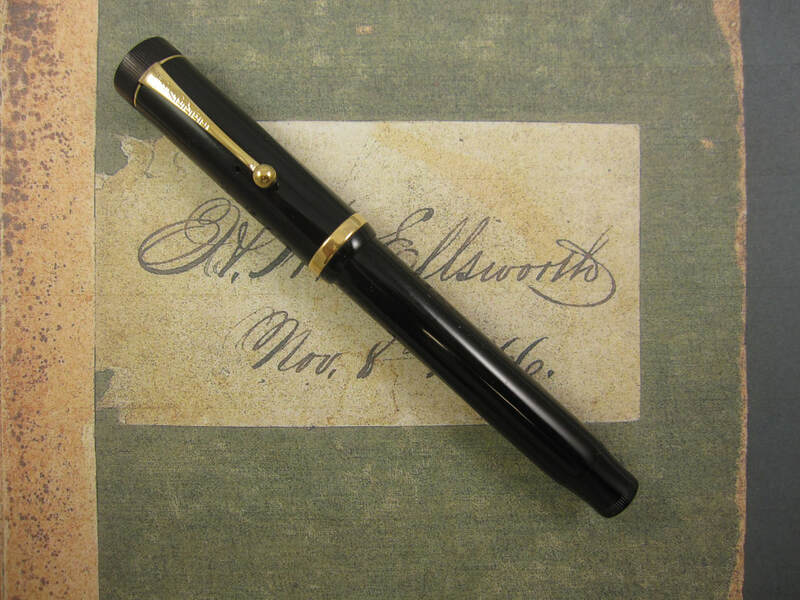 Fitted with a 14K Parker Duofold nib that writes a smooth fine line. This is firm nib. Correct Christmas tree feed. Awesome exterior color, great barrel imprints. 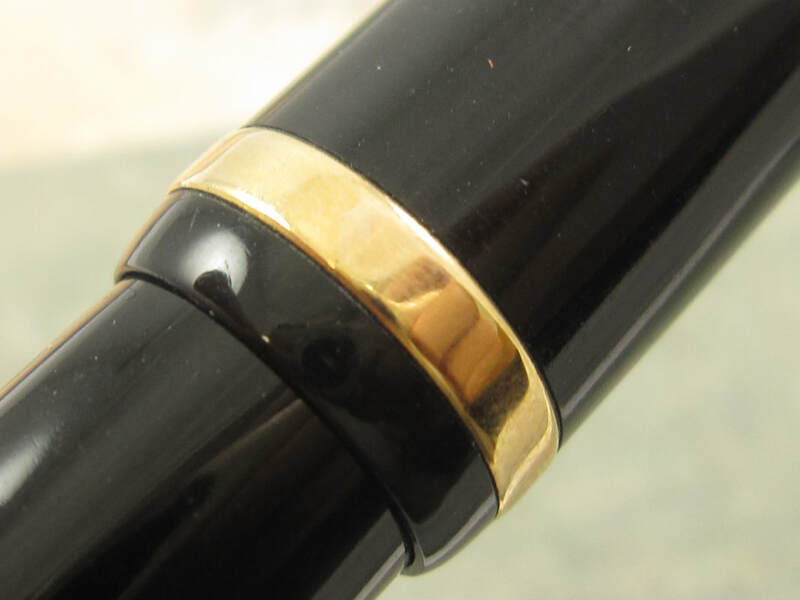 Some tarnish in the gold cap bands. Button filler. Made in Italy. 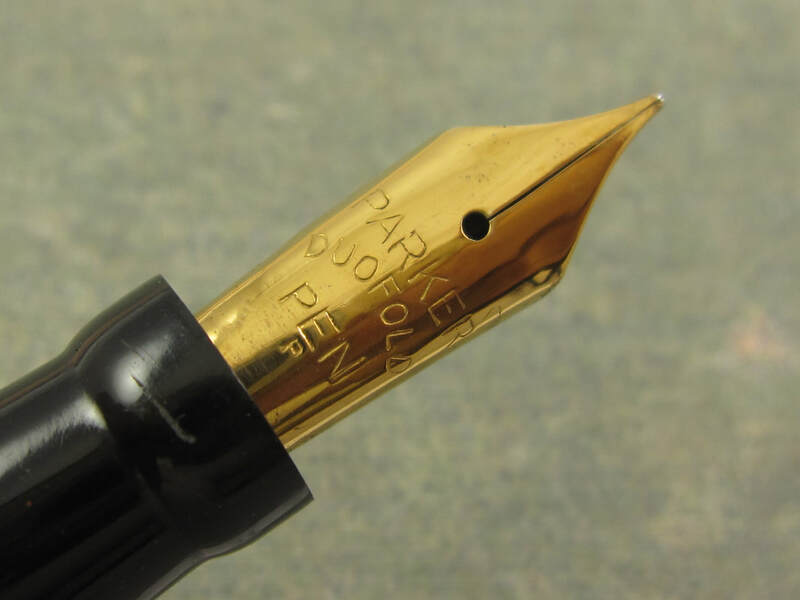 Nib Type: Broad, Firm Imprints: No Length: 4 1/2"
Nib Type: Fine/Medium, Rigid Imprints: No Length: 5 1/2"
COMMENTS: From my personal collection ... Parker Duofold Senior in Black permanite and gold trim. Raised band model. Fitted with a 14K Parker Duofold nib that writes a fine/medium line. Professionally adjusted nib. Very smooth. Correct Christmas tree feed. 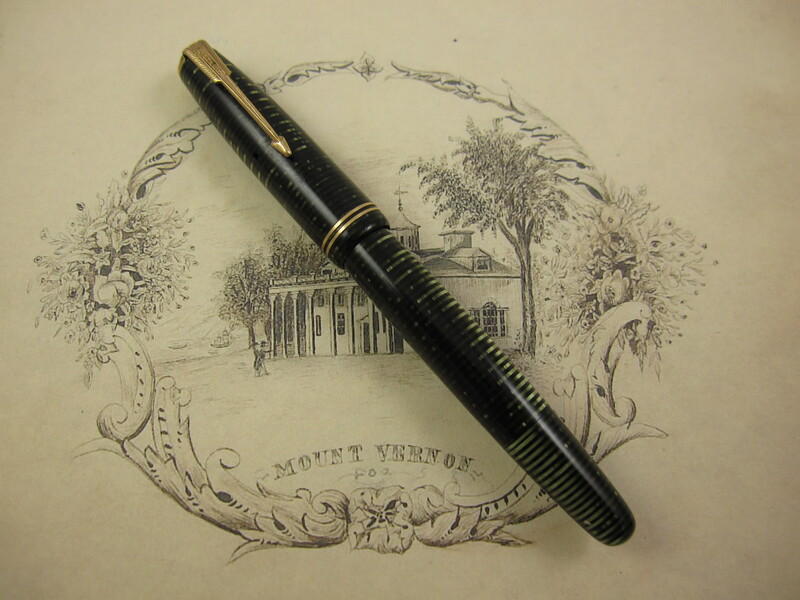 Pen measures 4 1/2" long (capped) and 5 5/8" long (posted). 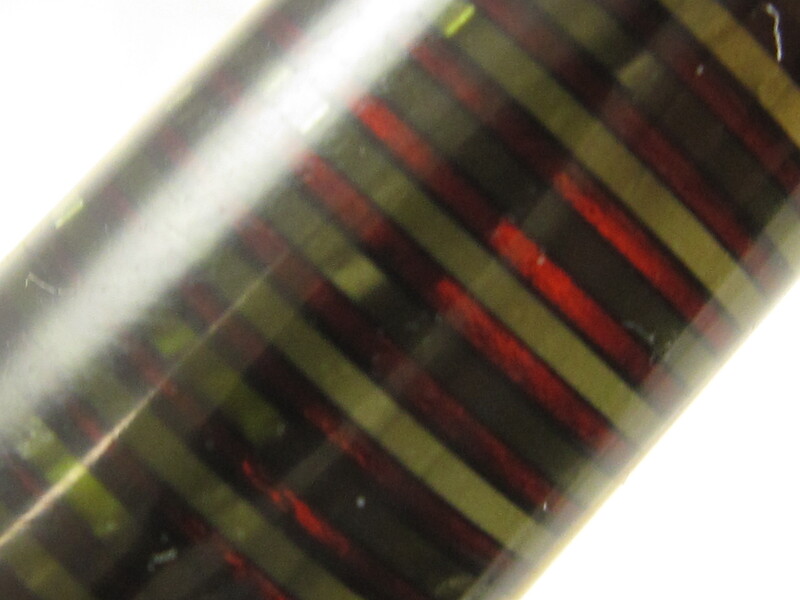 Barrel has light discoloration (darkening). Great barrel imprints and gold trim. A very clean pen in a very desirable color. Button filler. Made in USA in 1920s. 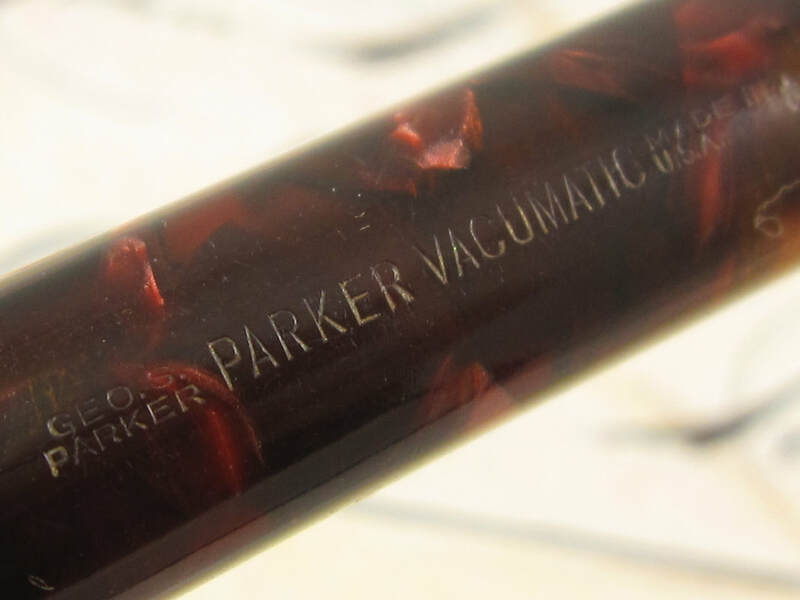 Nib Type: Extra Fine, Firm Imprints: No Length: 4 3/4"
COMMENTS: Parker Vacumatic 1st. generation in burgundy celluloid and gold trim. Junior sized model. Matching double jewels in black color. Two slim gold bands on the cap. The 1st. 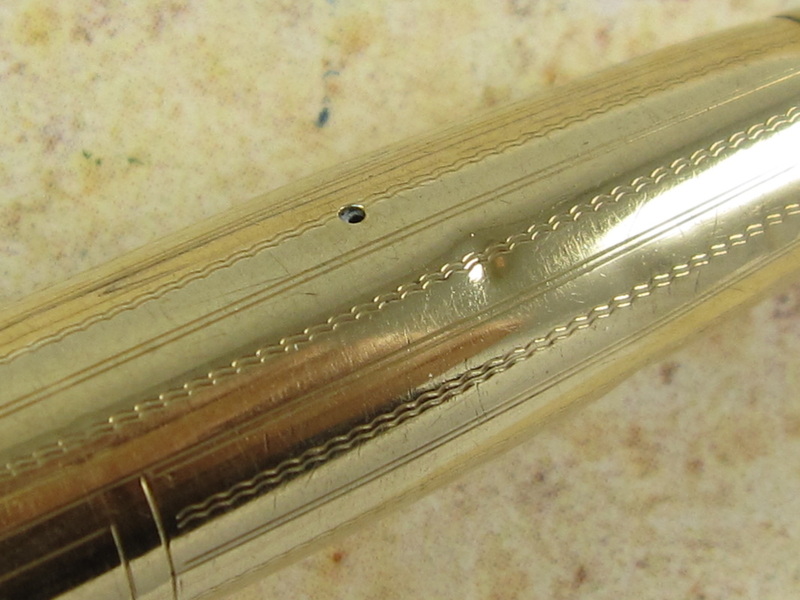 generation Vacumatic pens have a very distinctive profile with a fairly wide diameter. 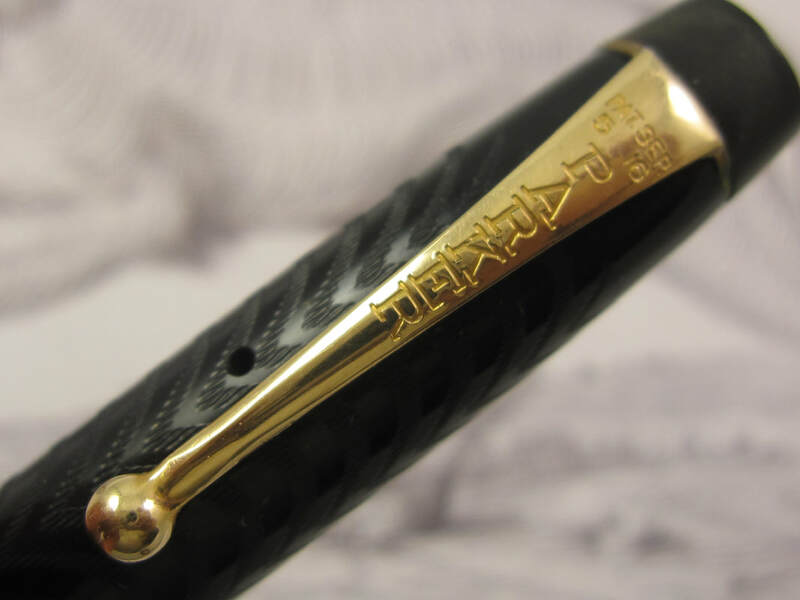 This combined with their wider feather type clip are the focal point of these pens, turning them into ultra elegant pens. 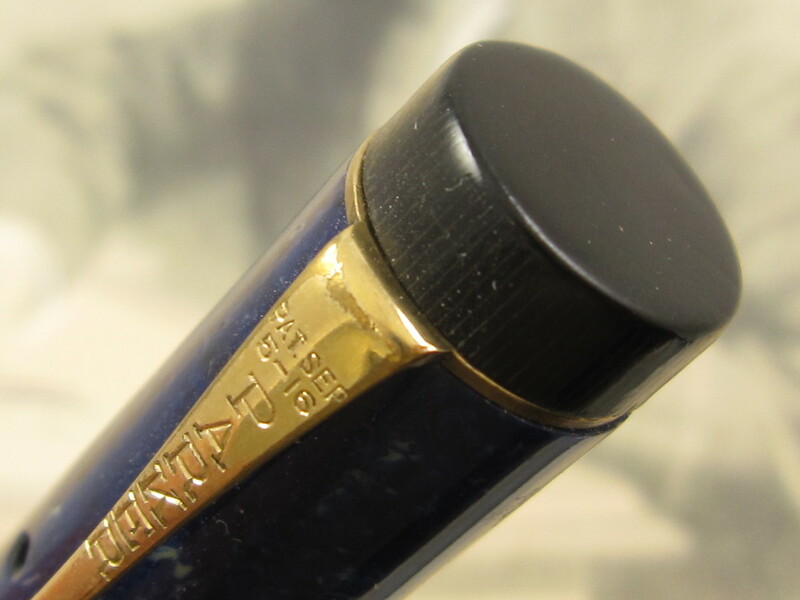 Fitted with a 14k monotone Parker nib with the feather imprint that writes an extra fine line. 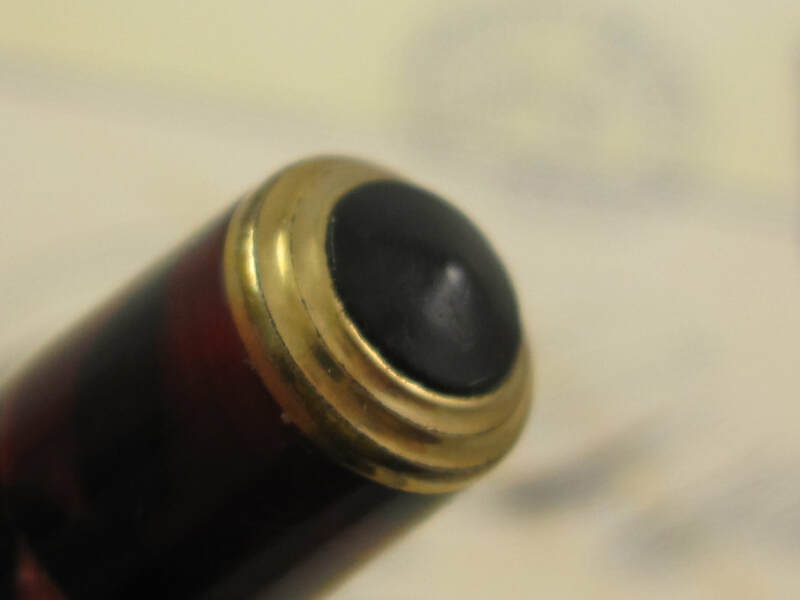 This is a firm nib that has been professionally smoothed. Fairly clean pen. 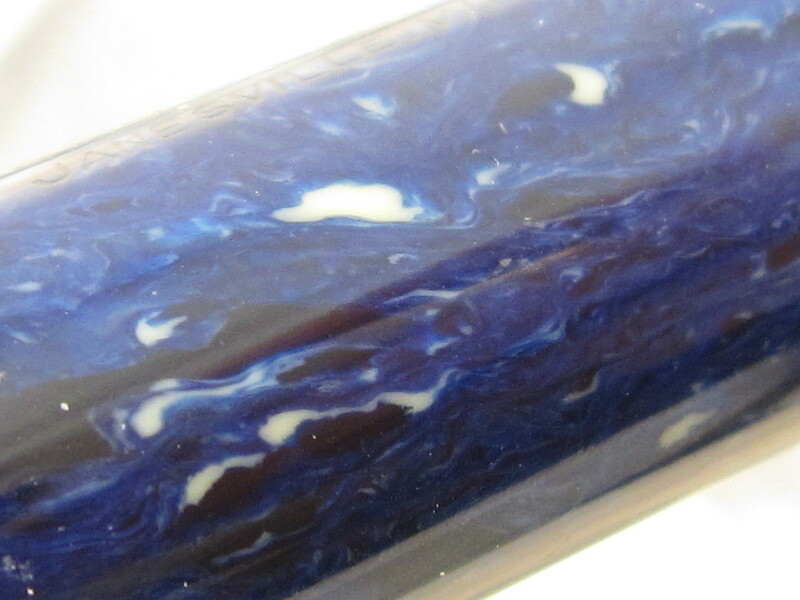 Nice celluloid colors with a translucid area that allows to see the ink level inside the pen. 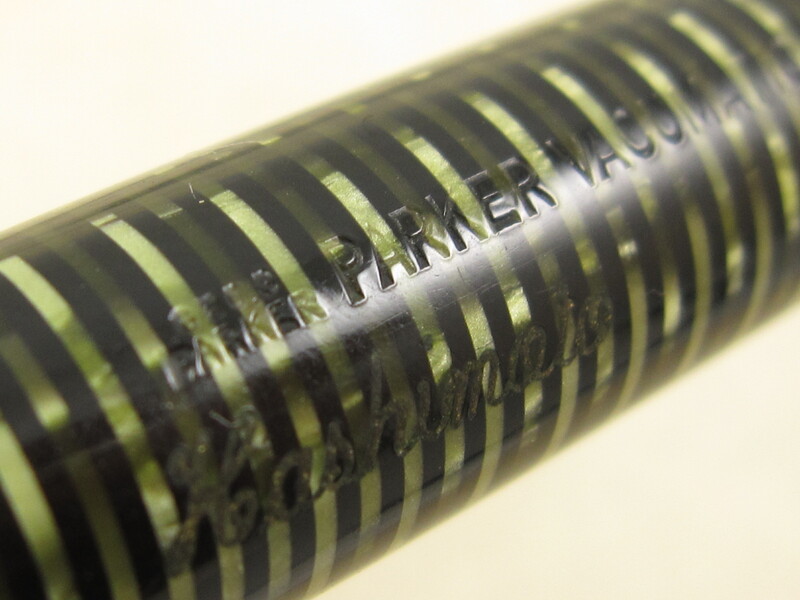 Vacumatic filler with the lock down metal mechanism. Serviced and with a new diaphragm. Made in the USA in the fourth quarter of 1935. 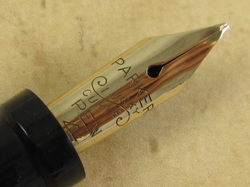 FACTORY ORIGINAL FLEX NIB !!! Nib Type: Med. 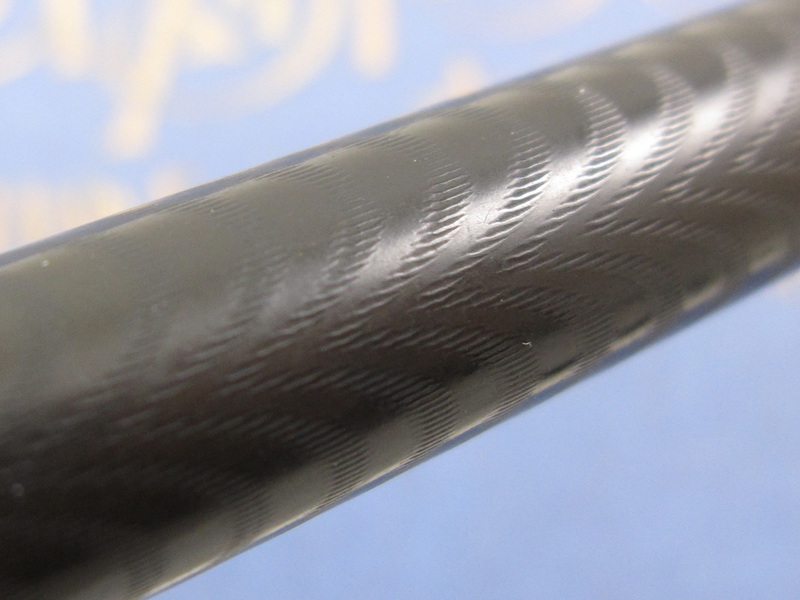 Flex M-BB Imprints: Yes Length: 5 1/8"
COMMENTS: Parker Vacumatic 2nd. Generation jewel in the standard size. 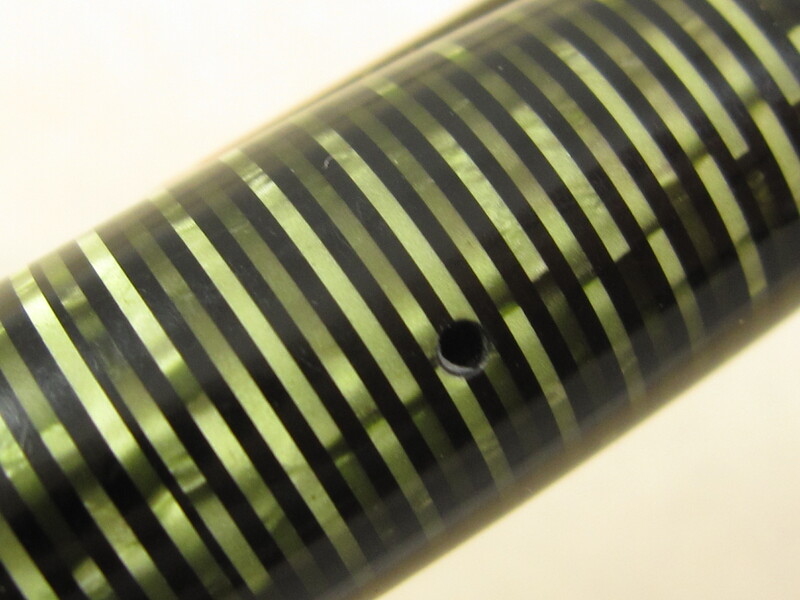 Green Pearl celluloid with gold trim. Two slim gold bands on the cap. Barrel has medium transparency. Black jewel and section. Fitted with a single-tone 14k Parker Vacumatic medium flex nib that writes a medium (border line with a broad line) to double broad line. 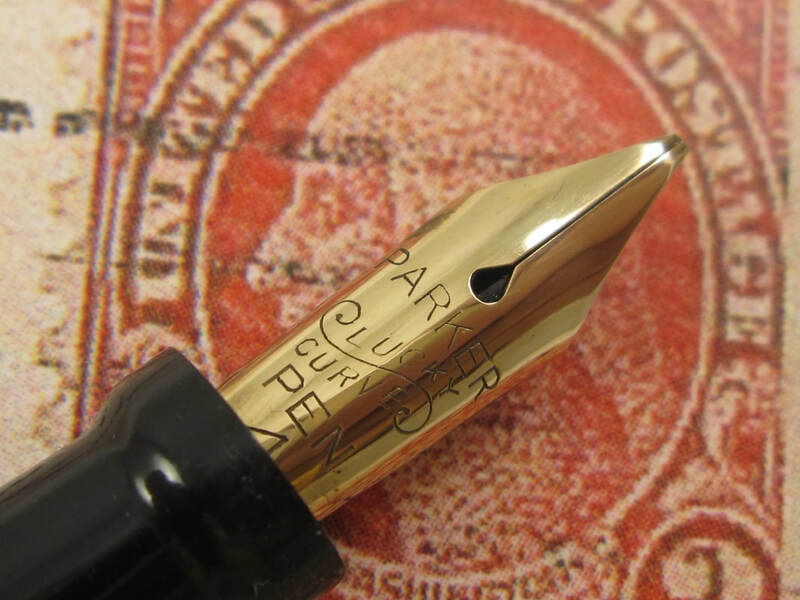 Professionally adjusted nib, ultra smooth nib, and capable of writing at any speed when not flexed. 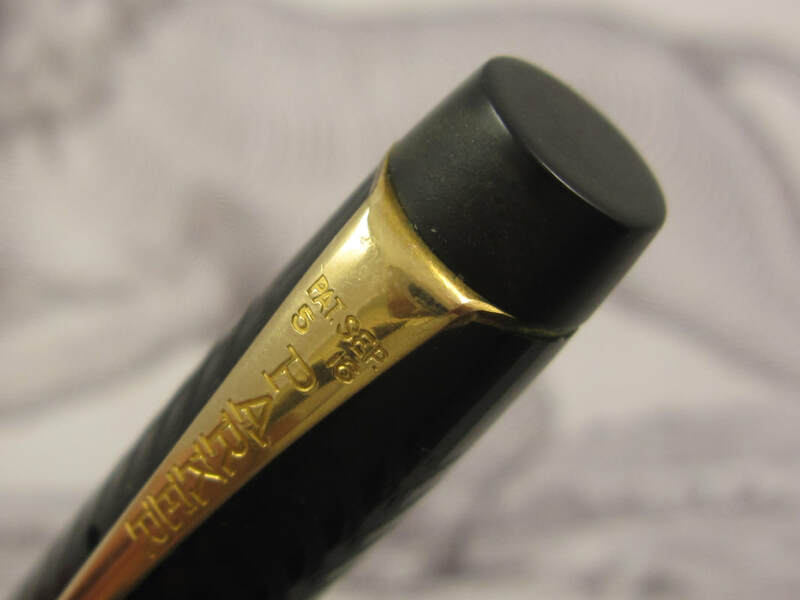 This nib also has very rounded tipping, making it a very user friendly and a great nib to an over writer or to someone new to flex writing. 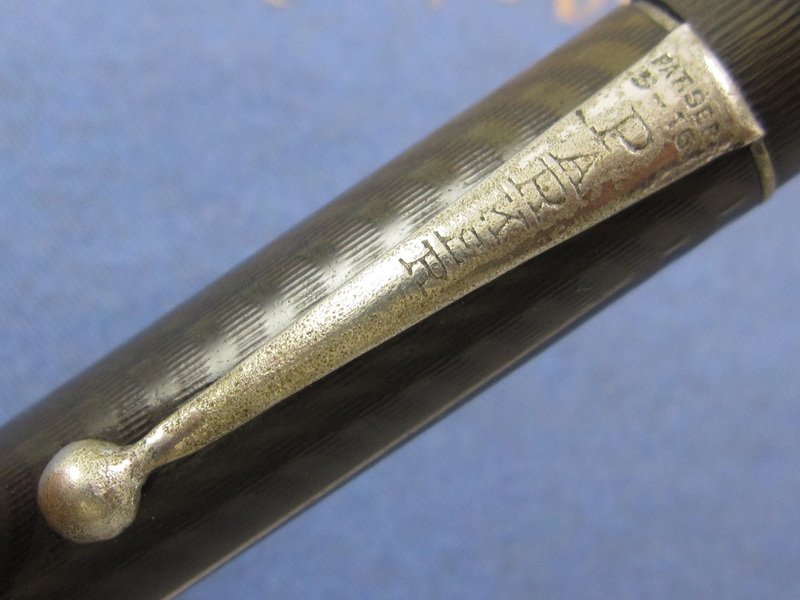 Most Vacumatic pens come with firm nibs. 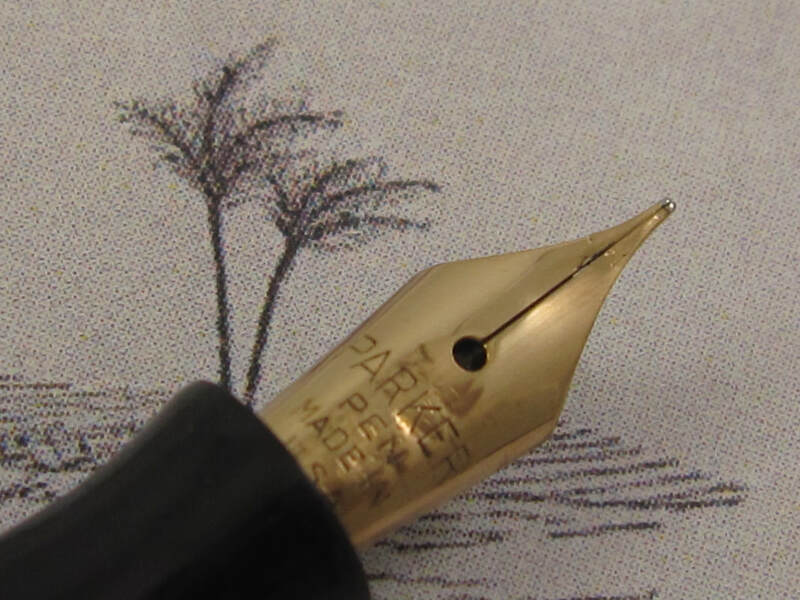 Finding one with a flex nib is not common, and makes the pen more valuable. 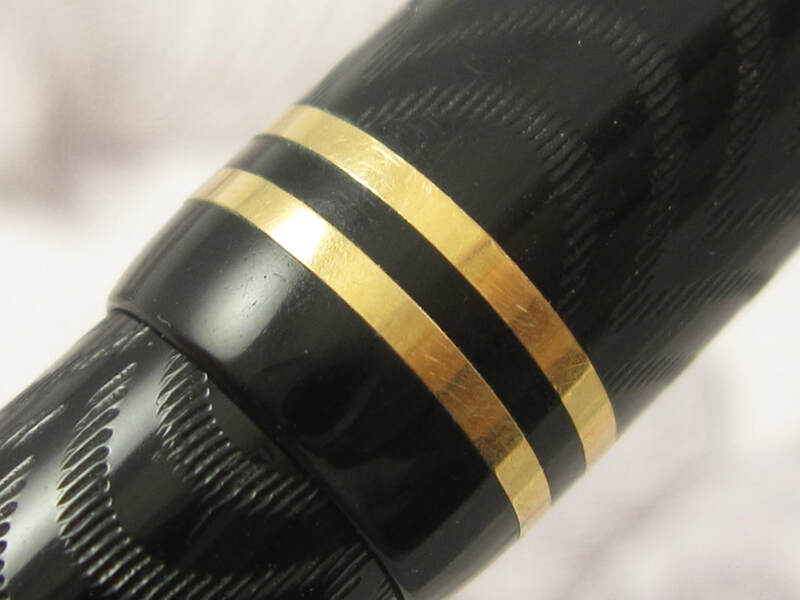 Great celluloid color, great barrel imprints and very clean gold trim. Vacumatic plastic button mechanism, which is incorrect for this model. The correct one should be the "speedline" aluminum filler version. 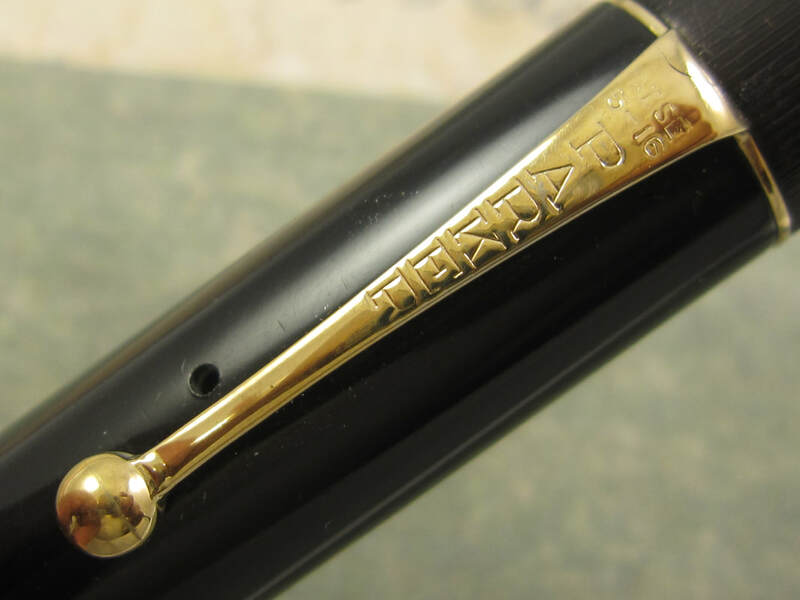 Name "Hashimoto" has been professionally imprinted right below the factory barrel imprint, as shown in one of the pictures above. Fully serviced and with new diaphragm. Made in USA in 1937. 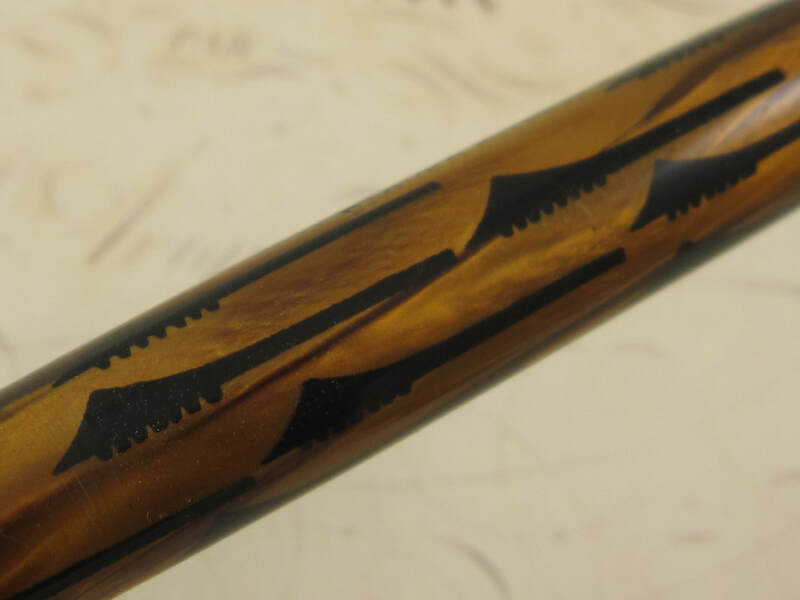 Nib Type: Extra Fine, Firm Imprints: No Length: 4 13/16"
COMMENTS: Parker Vacumatic Imperial Demi in Brown Pearl celluloid and gold trim. Black jewel in the cap. The cap has the wiggly line pattern. Blue diamond type clip. Fitted with a monotone 14K Parker arrow nib that writes an extra fine, firm nib. Ultra smooth nib, capable of very thin lines, and a phenomenal writer. Indicia in the cap has not been personalized with any engraving. 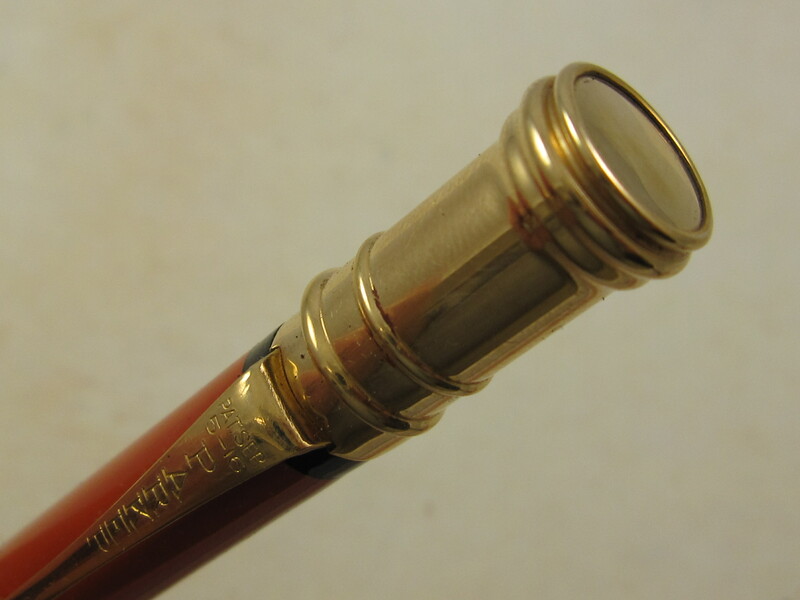 Maximum transparency in the barrel, making it a more valuable pen. Cap has a few small dings, reflected on the price. Very clean pen. Plastic button vacumatic filler. Made in USA circa 1940. 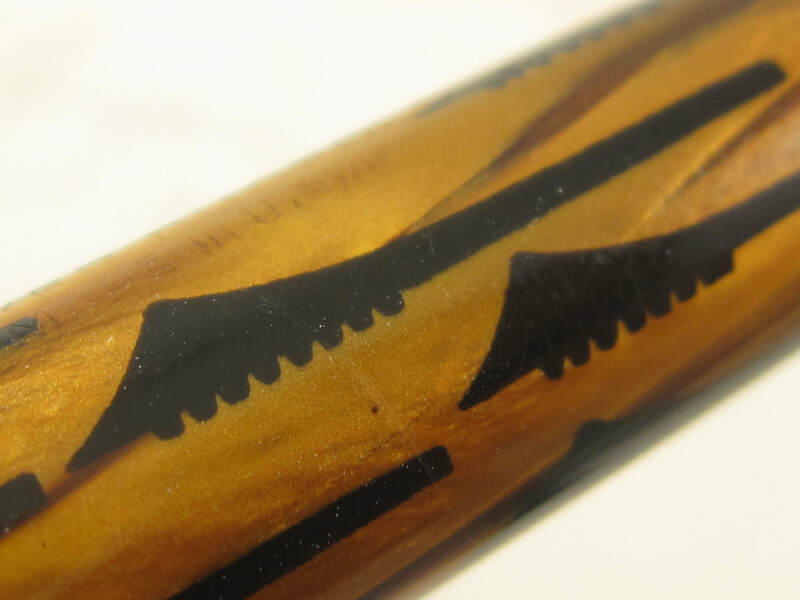 Nib Type: BB Stub, Rigid Imprints: No Length: 5"
COMMENTS: Parker Duofold Geometric "Toothbrush" standard size fountain pen in brown celluloid color and gold-filled trim. 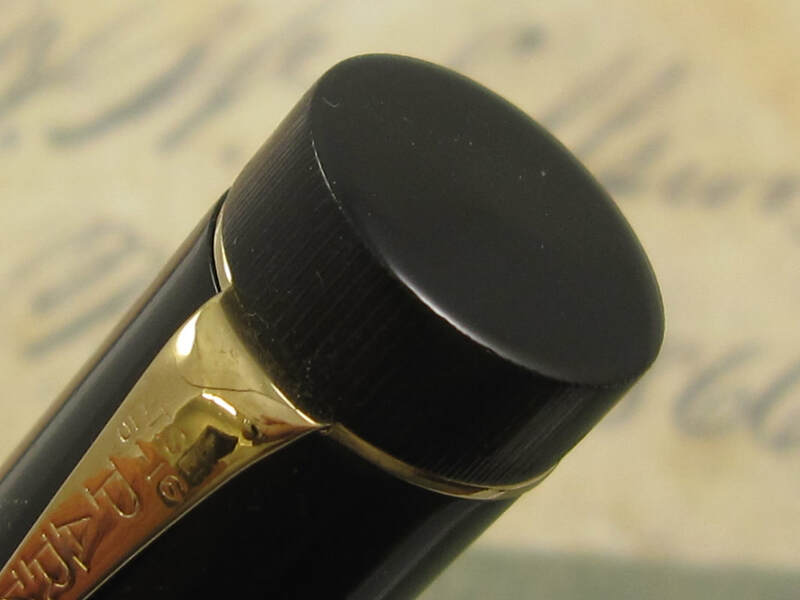 Wide gold band on the cap. 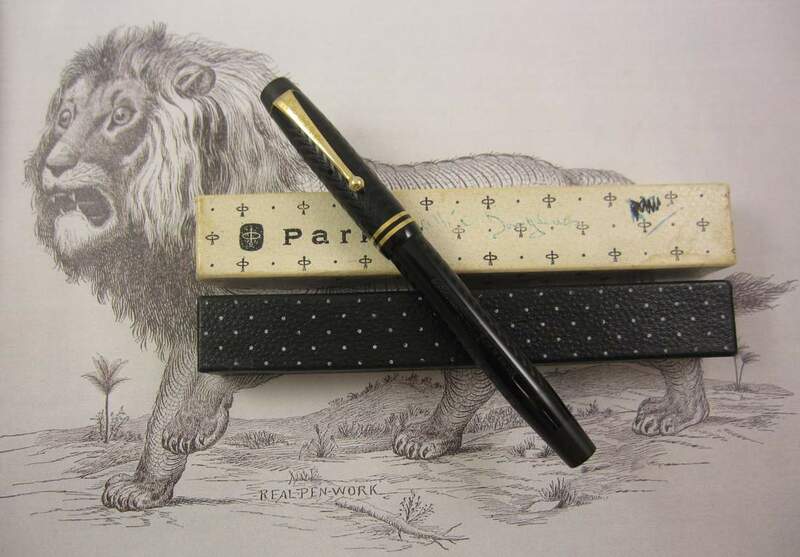 This was an economy pen which started being produced in the late 1930s. Its focal point is the toothbrush patterned celluloid. 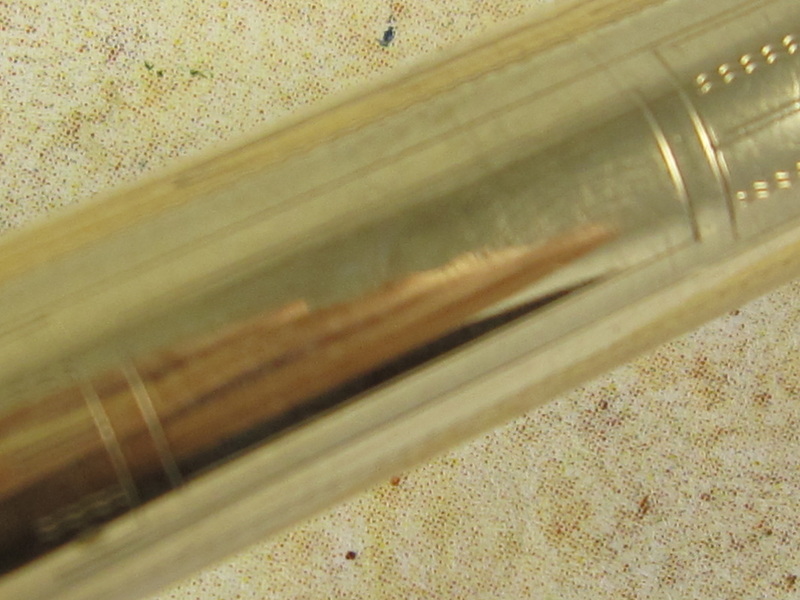 About half of the section is semi-translucid in amber color, allowing to see the ink levels inside the pen. Fitted with a 14k Parker rigid BB Stub nib. This is a factory original nib, an ultra smooth one, and a very valuable nib. 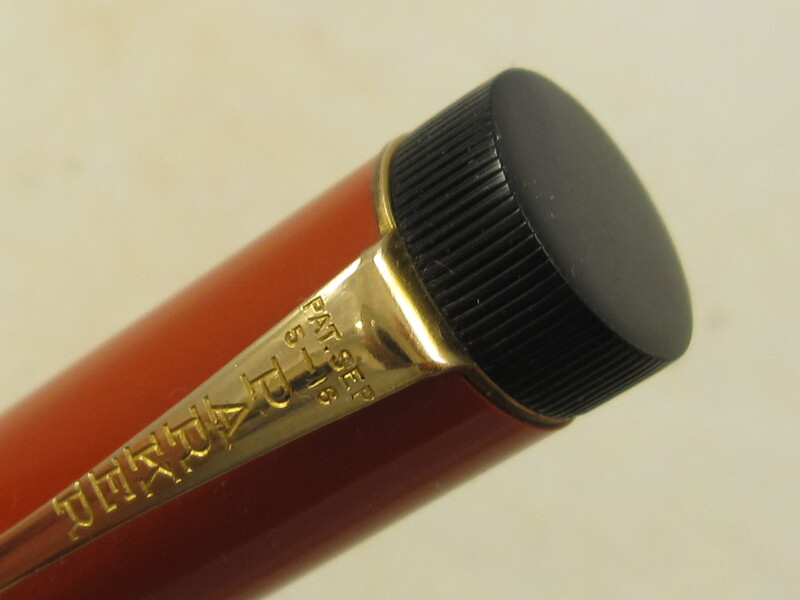 Other than some gold plating loss on the clip, this is an ultra clean pen and in a very attractive color. Button filler. New sac. Made in USA in the late 1930s.